New applications for plastic and rubber materials are being developed almost daily. 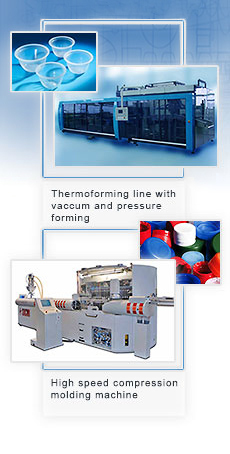 We provide the plastic processing industry with advanced, fully automatic extrusion lines as well as thermoforming-, compressionand blow-molding machines for a wide range of highquality plastic products, including industrial filaments, single-layer and multi-layer films, cups and lids, bottles and bottle caps. For the production of liquid silicone rubber parts, we deliver injection molding machines and molds to leading Japanese manufacturers. Large webs of woven synthetic fibers are required in the paper-making process. Almost all Japanese manufacturers of such webs use special weaving machines imported and sold by Correns.